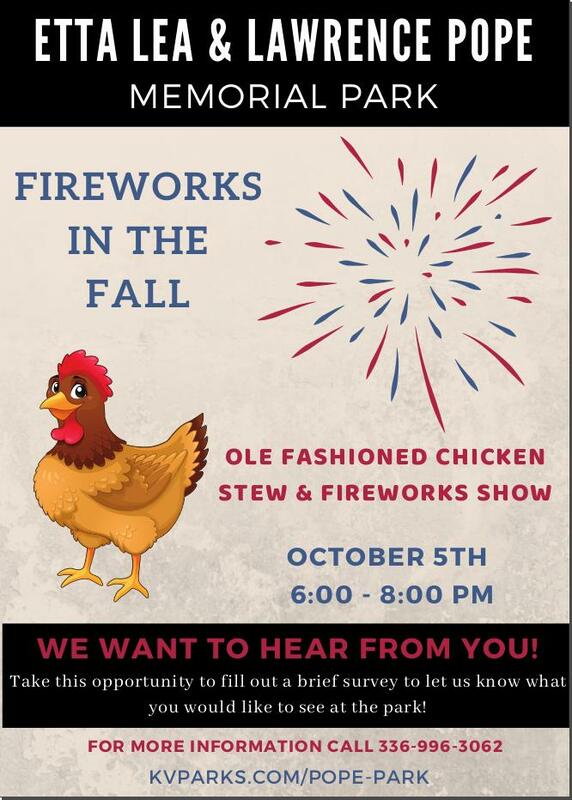 Join us this Friday, October 5th at Etta Lea & Lawrence Pope Memorial Park for Fireworks in Fall! Thanks to all your input from the last event in June, we now have two versions of the conceptual drawing. Come out and vote on which of the two versions you like, as well as if you want to switch some of the amenities. The fun will start at 6:00pm. You have the option to park inside the park (through Southern Street), or at Lowe’s Food and we will provide hayrides onto the property. Along with the input we hope to gather from everyone, we will have Chicken Stew. Instead of charging per bowl, we are accepting donations per bowl! Yes, you heard right! For a bowl of chicken stew please provide any amount of donation you see fit. All proceed will go to furthering the development of the park. How cool would it be to say YOU helped build Pope Park?! At the end of the night we will shoot off fireworks! So please be sure to bring a lawn chair to enjoy the show!